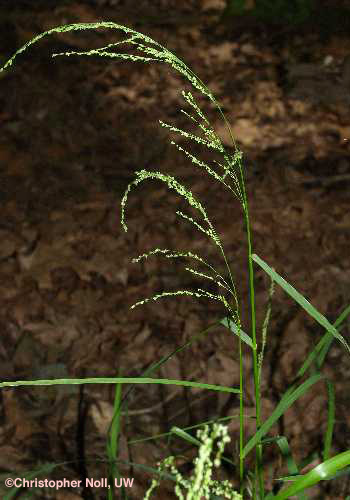 Glyceria striata.© Christopher Noll, University of Wisconsin, Steven’s Point. www.uwsp.edu (Accessed 5/2014). Glyceria striata is a perennial C3 grass (Morgan and Brown 1979; Basinger 2002), tufted, 50 cm to 1.2 m tall, slender, delicate, pale, slightly blue-green. Leaves very distinctly ranked in one plane, especially on non-flowering stems, 0.2-0.5 cm wide, uppermost 10-30 cm long, flat, rough above, ligule 0.1-0.3 cm, sheaths rough, closed almost to top. Flower spikelets pale green to purplish, oval, 0.3-0.4 cm long, 3-6 flowers, glumes much smaller than spikelet, blunt, 1-veined, lemmas elliptic, about 0.2 cm, blunt-tipped with prominently raised veins, 2 anthers; inflorescence open, delicate, 10-20 cm long, numerous capillary branches ascending, drooping at tip, spikelets mostly beyond middle; June-July. Habitat: Wet woods or open marsh edges, soil pH 4-8; tolerant of shade, intolerant of drought, fire, salt (USDA, NRCS 201). Notes: Plants shown to be infected by endophytic fungus Epichloë glyceriae (Clavicipitaceae, Ascomycota) show greater clonal growth than those without infection (Cheplick 2004). The cross fertilization of this fungus is carried out a symbiotic flies (Botanophila sp. ), (Clay and Leuchtmann 1989; Schardl and Leuchtmann 1999).